Melascreen Eclat lightens and evens the complexion, in particular in case of irregular pigmentation. The skin's radiance is restored. Its fluid and moisturizing texture, enriched in mattifying and absorbing powders, constitutes an excellent make-up base. 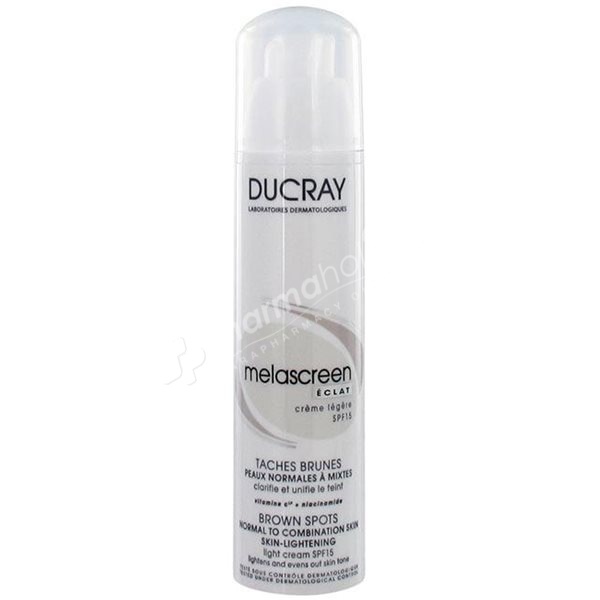 Thank to the synergistic and complementary action of 2 active ingredients, Ducray Melascreen Eclat Lightening Light Cream SPF15 supports skin lightening of the superficial brown spots. Ideal for normal to combination skin. Vitamin C, also called ascorbic acid, acts inside the melanocytes (cells making melanin) by blocking the enzyme implied in the excessive synthesis of melanin. Through its antioxidant activity, it also attenuates the surface coloration of oxide melanin. Vitamin C under the shape of Ascorbyl Glucoside, is gradually released during application to the skin, which ensures a durable activity. Niacin amid allows blocking the synthesised melanin before appearance to the skin. Melascreen Eclat lightens and evens the complexion, in particular in case of irregular pigmentation. The skin's radiance is restored. Its fluid and moisturising texture, enriched in mattifying and absorbing powders, constitutes an excellent make-up base. This care also contains photo protective filters, which ensure a SPF15 protection against brown spots. Tested under dermatological control. Non-comodegenic. Aqua, Ethylhexyl Methoxycinnamate, Ascorbyl Glucoside, Caprylic/Capric Triglyceride, Isohexadecane, Niacinamide, Triethanolamine, Polysorbate 40, Methylene Bis-Benzotriazolyl Tetramethylbutylphenol, Polymethyl Methacrylate, Sorbitan Palmitate, BHT, Butylparaben, Carbomer, Cetyl Alcohol, Chlorphenesin, Decyl Glucoside, Parfum (Fragrance), O-Phenylphenol, Phenoxyethanol, Propylene Glycol, Xanthan Gum.